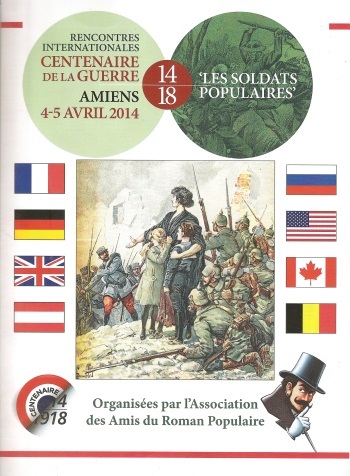 In Amiens last week I attended a meeting of L’ Association des Amis du Roman Populaire. This is a group of academics and others interested mostly in French popular fiction of the last century, and the two-day conference was about the popular literature of the Great War. 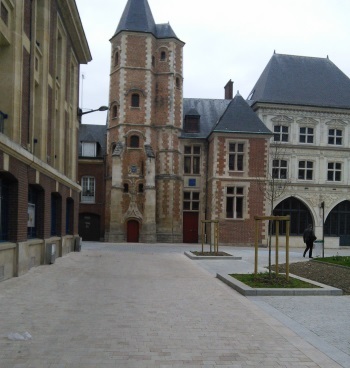 We met in the Logis du Roy in the centre of Amiens, very close to the Cathedral. I gather that Amiens is the chosen centre for the Association’s activities because it was the home of Jules Verne, possibly the greatest of French popular novelists. There is a Verne museum in the town, which I’d hoped to visit, but the conference kept me too busy. Mostly the conference papers covered French popular literature (novels, stories, feulletons, children’s magazines and so on), though there were also contributions about German and Austrian literature. Another Brit, Michael Paris, had also been invited, but he had to drop out at the last moment – a pity, since I enjoyed his book, and would have liked to meet him. So I was the only contributor from this side of the channel, speaking about ‘Sapper’ and his transition from relatively realistic war stories to the wild melodrama of Bulldog Drummond. I won’t try to summarise the gist of all the papers, if only because my grasp of spoken French is not what it was. I became very grateful to speakers who, in the classic style of the French academy, provided a PowerPoint display with headings and sub-headings that made the paper’s structure quite explicit. Several speakers left me rather puzzled, to be honest, and of one fast-talker I hardly understood a sentence. Afterwards, others told me that her paper was good. I’m looking forward to the promised publication of the conference papers, when I hope to discover what it was all about. I gained a few insights into the ways in which French popular literature was different from British. The usual stereotype of the German, as one might expect, was even more negative in a country that had been invaded. I had wondered a while back whether the French had any equivalent of the British portrayals of the Kaiser as a figure of pathos, and was told that no, Gaston Leroux’s diabolical description of him was much more typical. The ban was inspired by criticisms that the tales gave an unrealistic picture of war, and that their dashing young heroes were individualists who often displayed a disregard for authority and social hierarchy. In Britain there may have been sniffy comments about the low quality of some magazine stories, but there was no such ban. Instead, when Northcliffe took over the Ministry of Information, officially-sponsored literature became more populist. 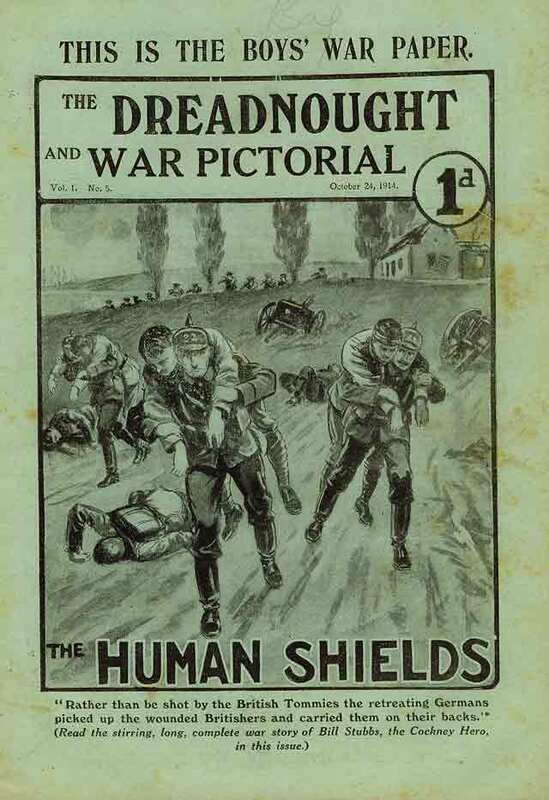 In the early days of the War, Wellington House material had been very high-minded – the Oxford History professors’ presentation of the British case is a typical example, later products aimed much lower. In the parliamentary debate of 5th August, 1918 voices were raised against the low quality of the material that was actually being sponsored by the Ministry of Information, and especially the nasty little short film The Leopard’s Spots, sometimes known as Once a Hun, Always a Hun. Cultural comparisons like this help show ways in which the British literary treatment of the war could have been different, so the conference gave me plenty to think about. It was also very well organised, and the midday buffet lunches put most British conferences to shame. By the way, while in Amiens, I was pleased to see a street named after a Great War writer. Do we have any Sassoon Avenues or Manning Parades in Britain? This entry was written by George Simmers and posted on April 10, 2014 at 5:51 pm and filed under academic, History, popular culture. Bookmark the permalink. Follow any comments here with the RSS feed for this post. Post a comment or leave a trackback: Trackback URL. Your query concerning Sassoon Avenues and Manning Parades has had me wondering how Canada fares in this regard. I’ve walked on McCrae Boulevard in Guelph, the poet’s hometown, but know of nothing similar. A quick look at Google Maps shows a Sassoon Close in East Malling, surrounded by other addresses named after poets and prose writers from Auden to Thackeray; and a Sassoon Close in Wellingborough, near an Owen Close and a Shelley Road. I guess there are more. It would be interesting to look at who gets picked and who doesn’t. Well spotted, Tom. Yes, it would be interesting to see who was picked, and also when the naming was done. By the way, there’s a Brooke Close in Wellingborough, keeping Owen and Sassoon company. There are Wilfred Owen Closes in Wimbledon, Oswestry [of course], Shrewsbury andMarket Drayton. 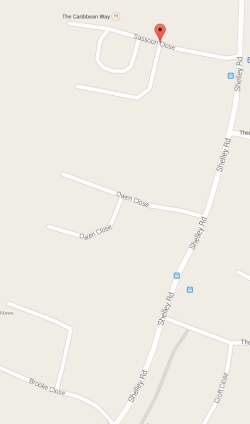 Oswestry also seems to have a Wilfred Owen Road and a Wilfred Owen Avenue. There are Rupert Brooke Roads in Rugby and Loughborough. There’s an Edward Thomas Close in Rudry in south Wales, but it doesn’t appear to be close to other literary street-names, and might be named after a local hero/dignitary. I can’t see anything named after Isaac Rosenberg. Off-topic, but permissible, I hope – there’s a corner of Milton Keynes with streets [or Closes and Avenues etc] named after Hendrix, Cogan, Valens, Monro, Darin, Vincent, Lennon, Redding, Kidd, Cline, Armstrong, Mercury, Attwell, Presley, Crosby, Morrison, Bolan, Holly, Dorsey, Holliday and Fury. [I may have missed a couple.] The musical/cultural associations of the names are varied, but what they have in common is being dead, often prematurely. I’d love to have been at the committee meeting when the planners argued for who got in and who didn’t. Did they do karaoke? Or sob over their cherished vinyl? I remember reading in the New Statesman’s This England column many years ago of a local council which considered naming new streets after English poets until the councillors learned something of the poets’ private lives. Morally outraged, they named the streets after ex-councillors.